Commentators have frequently, and with due cause, taken umbrage at the portrayal of women, particularly companions, in Doctor Who. Renown for her lung capacity as much as her acting ability, Deborah Watling’s characterization of the Victorian era companion, Victoria, has been the subject of more than its fair share of criticism. Akin to some feminist Biblical commentators who trawl to Bible to inspire fresh pro-women interpretations, so Victoria’s well known and frequently decried propensity to scream is being re-interpreted and hailed by me as a new foundation for women in Doctor Who. “How can it be so?” you may ask as your casually scratch your heads. Well, precisely because in The Fury From the Deep, her last serial, Victoria’s screams are transformed into perhaps the most lethal weapon that the Doctor has ever used against ravaging monsters. 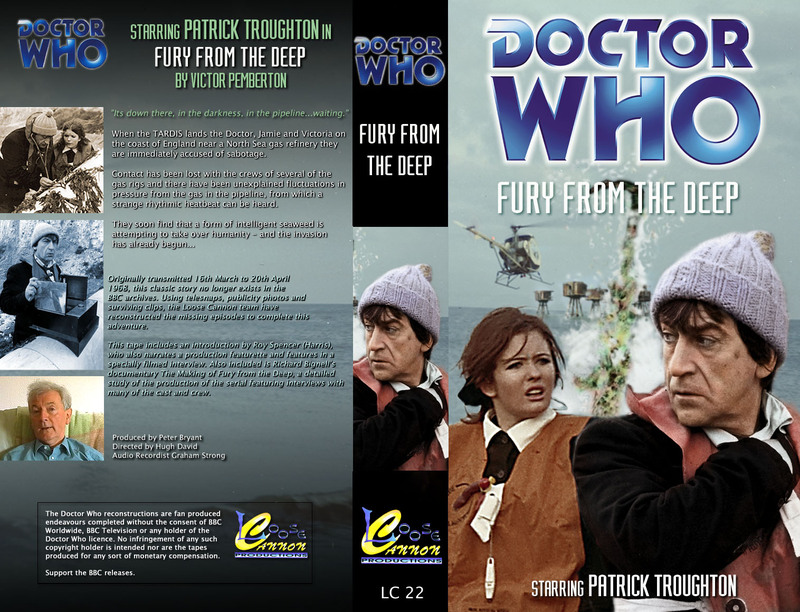 Fury from the Deep is Deborah Watling’s last serial as Victoria. Whereas the kindly Sensorites were repelled by bright light, in The Fury From the Deep high pitched noise is the seaweeds’ weakness. Victoria’s scream was the anecdote needed to cure the residents of the base of their infestation of seaweed. Having realized the link between noise and the retreat of the seaweed, the Doctor records Victoria’s screams on a tape recorder and then broadcasts them down the gas rig’s pipe system. Amplified to a frightening level, the distorted din of Victoria’s screeches caused the weed’s rapid retreat. Victory was achieved not by brawn or muscle, but merely by the harnessing of fear. 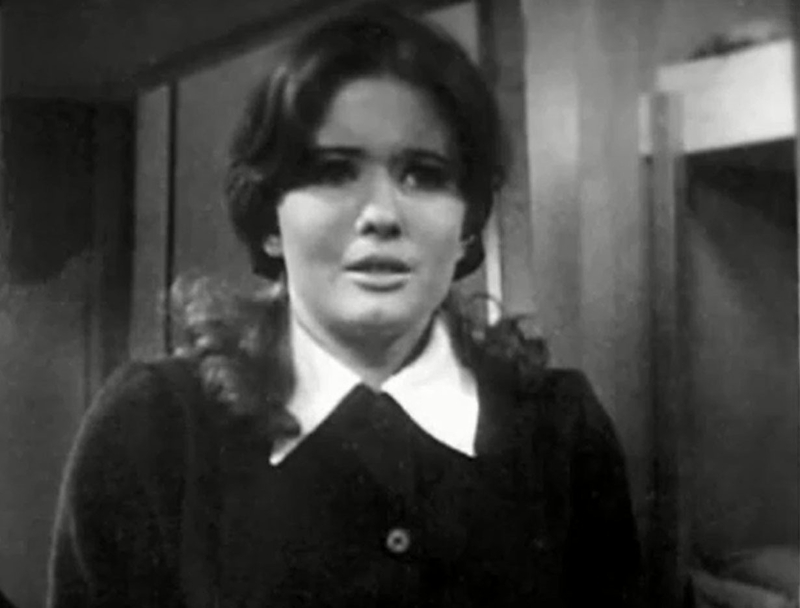 Whilst a desire to depart from the TARDIS was verbalized from time to time by Ian and Barbara, Victoria is the only companion since the teachers to repeatedly express frustration at life in the TARDIS. Admittedly Steven barged out of the TARDIS in anger at the Doctor’s egocentrism at the end of The Massacre, although he was decidedly quick to return. Commencing in the third episode of The Fury From the Deep, Victoria displays a real sense of unease with the near constant battles that the TARDIS crew are confronted by. Counselled by Jamie, who is clearly distressed at the thought of her leaving, Victoria’s anxiety deepens as the serial progresses. At one point she says to Jamie “Why can’t we go somewhere pleasant? Where there’s no fighting, just peace and happiness?” When Victoria asked the Doctor why they always land in trouble his response was less than satisfactory. “Well, Victoria, it’s the spice of life, my dear”, the Doctor responded. Danger was not a spice that Victoria cared to have added to her dish of life. One wonders how an oil installation in the middle of the sea, with a couple whom she’d met only days before, could be preferable to the security which the Doctor and Jamie provided Victoria. Unfortunately Victoria had never been afforded the opportunity to properly grieve the death of her father at the hands of the Daleks. She clearly missed her father, as evidenced by her tender conversation with the Doctor in The Tomb of the Cybermen. If Victoria’s tenure was written today then I wouldn’t be surprised if an examination of Post Traumatic Stress Disorder would surface. Victoria’s adventures with the Doctor would have greatly exacerbated her PTSD symptoms which may well have included reliving her father’s death, amongst other things. Her departure, when considered in the light of her encounter with the Daleks, is a great deal more understandable. After the hasty retreats of Vicki, Dodo and Steven it was a relief to see a companion departure that was not rushed and actually pre-empted three episodes before she left. As you may well recall, Vicki stayed in Troy with Troilus, whom she had met but a day or two beforehand (The Myth Makers); Dodo disappeared to the country for recuperation midway through The War Machines; and Steven elected to remain behind to facilitate peace between the Elders and Savages in The Savages. The Fury From the Deep heralds the Doctor’s first use of his now ubiquitous, get out of gaol free card, the sonic screwdriver. 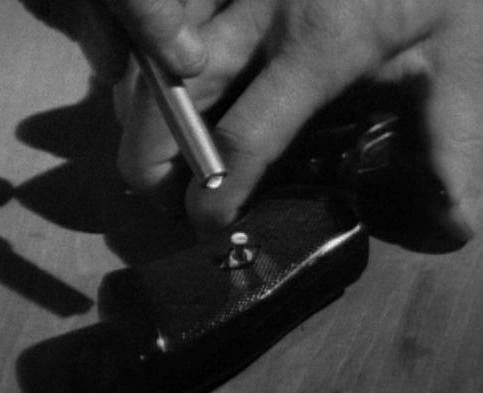 Confronted by a black metal box fastened to a pipe on the beach in episode one, the Doctor waves his magic wand and miraculously the screws unwind themselves. The Doctor had obviously never used the sonic screwdriver in Jamie’s presence before because the kilted lad innocently asks what it is. It “never fails”, the Doctor says of the tool which works on “sound waves”. I wonder if the writer, Victor Pemberton, still receives financial compensation every time it’s used? The sonic screwdriver makes its debut in this story. The Second Doctor’s sonic was a basic model and looked surprisingly like a pen torch. The sonic screwdriver is not without its critics. John Nathan-Turner, the producer of Doctor Who from 1980 to 1989, is frequently quoted as having said that “When the writers rely on it to get out of every tight situation, there’s no suspense, no variety, no drama”. The sonic screwdriver was destroyed in the Season 19 episode The Visitation (1982) and would not be seen again in Classic Series Who. That the Fifth Doctor did not use a sonic screwdriver was remarked upon in Time Crash, the mini episode featuring the Fifth and Tenth Doctors in 2007. The Tenth Doctor jokes to the Fifth Doctor that he “liked to go hand free, didn’t you, like hey, I’m the Doctor. I can save the universe using a kettle and some string. And look at me, I’m wearing a vegetable”. Mr Quill and Mr Oak, the menacing gas service men, are brilliant in The Fury From the Deep. Thanks to the ever vigilant Australian Censorship Board, Quill and Oak have the distinction of sharing the longest cut scene in the unfortunate history of missing episodes. Clocking in at 56 seconds, the viewer is treated to their entry into Mrs Harris’s bedroom as she is brushing her hair at a dressing table. Having tricked their way into her home by pretending to be servicing the stove, Oak and Quill open their mouths and omit a toxic gas which renders Mrs Harris unconscious. To achieve the effect of blackened mouths the actors John Gill (Oak) and Bill Burridge (Quill) ate charcoal biscuits before the scene. I doubt that they would have been keen to do that again! The silent menacing of Oak and Quill is perhaps one of Doctor Who’s finest examples of using the ordinary to produce terror. So too is Mrs Harris’s walk into the sea in which she is seemingly committing suicide. The “Yeti on the loo” effect is at its best in this serial. Even things as innocuous as seaweed, foam and gas workers are the source of nightmares. Watch the Oak and Quill clip from 0:36 onwards. I love the note that accompanies that clip – “Don’t watch if in Australia”! When the TARDIS landed in the sea before a white cliffed beach the Doctor was certain that the crew had landed in England. Jamie responded with suspicion, “Aye, it’s always England. 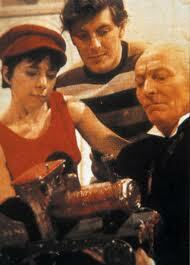 I think by the hammering the TARDIS has got, you’ve gone and spiked it”. As a Scot, the TARDIS’s propensity to constantly land in England probably annoyed Jamie immensely. It would not surprise me, however, if the writer Victor Pemberton was having a dig at the stereotypes that had built up around the programme. Together with Victoria’s screams, it’s refreshing that the programme could laugh at itself. Laughing at Doctor Who may well be warranted when we view the next serial, Season Five’s last offering, The Wheel in Space. Please join me as I continue my journey through Doctor Who. 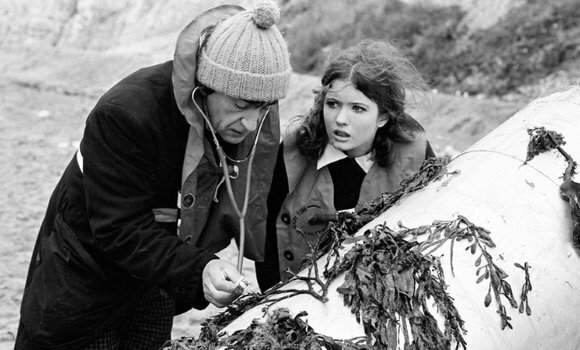 Fury from the Deep was originally broadcast in the UK between 16 March and 20 April 1968. 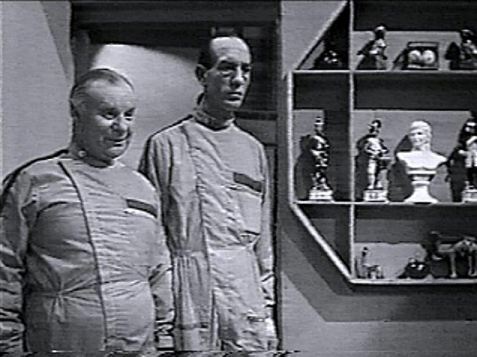 It is the last Doctor Who serial with all its episodes missing from the BBC Archives. I’ve corresponded with Victor Pemberton via e-mail. He’s a very nice, talented, humorous fellow. After he left Doctor Who, he worked on a number of different film and television projects. Among his credits are serving as a producer of the British version of Fraggle Rock and penning a series of semi-autobiographical historical novels. I’ve read the first two, and they’re really interesting. Victor lives in Spain nowadays. A few years back I mailed him my copy of the novelization of Fury From the Deep which he wrote (a very creepy read) so he could autograph it for me. So happy I have it signed by him. I really hope that one of these days at least one of the missing episodes of Fury gets re-discovered. Thanks for your comment Ben and the link to Victor Pemberton’s website. I was interested to read his clarification about “The Slide” and comments concerning “The Making of Fury From the Deep” documentary. You’ve inspired me to track down a copy of the novelization and have him autograph it. I’m sure that you must cherish your copy!